The 2017 Ford Fiesta Sedan is equipped with either a 120 hp, 112 lb-ft 1.6-liter engine or a 123hp 125 lb-ft 1.0-liter turbocharged motor. Depending on trim level a 5-speed manual or 6-speed dual-clutch automatic transmission is available. 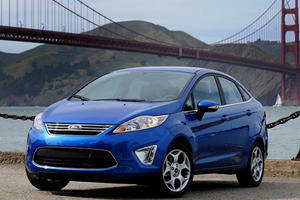 Performance levels are good but the little Fiesta’s dynamic abilities are what really raise it up in the rankings. A tight interior and limited cargo space may be an issue for some but equipment levels are good, especially on the upper trim levels. Notable available features include heated front seats, navigation, power sunroof and the feature-rich Sync 3 infotainment system. Introduced in 2011, the Fiesta Sedan has been on sale for quite a few years now, despite its advancing years it still offers one of the best drives in its segment and not much has changed for the 2017 model year. The Fiesta may be a subcompact but even for this diminutive class it has a noticeable tight interior. Occupants up front should not have too much problem getting comfortable and even taller adults will have no problem with head and leg room, however the rear seats are decidedly cramped and the trunk size is only average for this class. The cabin though feels decidedly more upmarket than the budget positioning of the Fiesta, material quality is good and the various switches and buttons feel solid to the touch. The Fiesta has always been one of the most enjoyable drives in this class and the sedan feels every bit as eager and sharp as its hatchback counterpart. The steering, road holding and responsive controls are a pleasant change from some of the more mundane subcompact offerings. The ride quality remains smooth and forgiving on most road surfaces and while the cabin is not a tomb of silence, it is pleasantly quiet enough on the highway. 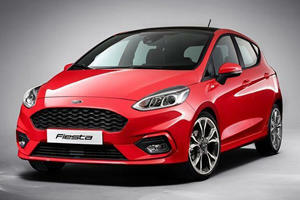 The Fiesta sedan is front-wheel drive and available with a base 1.6-liter four-cylinder engine that produces 120 horsepower and 112 lb-ft of torque. Those seeking a bit more responsiveness may prefer the turbocharged 1.0-liter 3-cylinder engine which provides 123 hp and 125 lb-ft. That may not seem like much more, but the turbocharged power delivery offers a far fatter torque curve, especially in the mid-range. A 5-speed manual transmission is available with both engines while the 1.6-liter engine can also be optioned with a 6-speed dual-clutch automatic. Performance levels are competitive for the class especially with the little turbocharged engine. 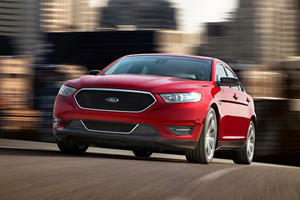 City driving will yield 27mpg and highway driving will see you get between 35-37mpg depending on the drivetrain. 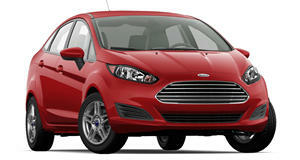 The Fiesta is available in S, SE and Titanium trim levels. The base S Trim is not as sparsely equipped as you might expect and offers air-conditioning, keyless entry, power mirrors a 3.5-inch display and a 6-speaker audio system as standard. You will have to wind up your windows manually though. SE Trim adds alloy instead of steel 15-inch wheels, auto-headlights, cruise control, ambient lighting, power windows, an overhead console and upgraded center console and trip computer. There is also the option of the 1.0-liter turbocharged engine on the SE trim but it can only be equipped if you forego most of the available extras and stick to the basic 5-speed transmission. A number of the Titanium’s features can be added to the lower trim levels and additional standalone options include a keyless-entry keypad, power sunroof and navigation system. The 201A Equipment Group is unique to the SE Trim and includes most of the Titanium trim features. The Ford Fiesta remains one of the most enjoyable subcompact cars around, it offers decent performance, good specification levels and a level of dynamism that elevates it above the average offerings in this segment. Rear passengers may not be too pleased with the interior space though and the cargo area is not particularly generous either. Opting for the higher trim levels opens up some desirable features. And yes, that means the Fiesta ST too. Ford has been aware of the issue for years but has yet to offer a fix.